The ranks of DirectX 12-compatible games continue to grow. Gears of War 4, Deus Ex: Mankind Divided, and Forza Horizon 3 all released in recent months with support for Microsoft’s next-gen graphics technology, and today, Civilization VI’s getting a big fall update that adds DX12 along with some new multiplayer goodies. Initial DX12 support for many games has been rocky as developers learn the ropes of the new “close to the metal” API, but Firaxis is an old hand at cutting-edge graphics. Civilization: Beyond Earth notably supported AMD’s Mantle—the precursor to DX12 and Vulkan—both to improve performance overall and create buttery smooth gameplay experiences in multi-GPU CrossFire systems by utilizing a “split frame rendering” technique, which assigns each graphics card a portion of each frame to render, rather than having the cards alternate rendering of entire frames, as is the norm. While split frame rendering isn’t returning for Civilization VI, Firaxis and AMD are partnering in order to support DirectX 12’s explicit multi-adapter (read: multi-GPU) and asynchronous compute technologies. You’ll need a Radeon 7000-series or better graphics card—anything released since 2012, really—or an Nvidia GTX 750, GTX 900-series, or GTX 10-series card to run Civ VI’s DX12 mode. Asynchronous compute allows graphics processors to run compute and graphics rendering tasks simultaneously, rather than waiting for one task to finish before performing another. AMD’s Radeon graphics cards like the Radeon RX 480 are especially well adapted for async compute tasks as they feature dedicated asynchronous shader hardware. Async compute shines in strategy games like Civilization VI—see the DX12 implementations in Ashes of the Singularity and Total War: Warhammer—as strategy games lean heavily on the CPU to keep track of all the units in play before passing that info to the GPU. 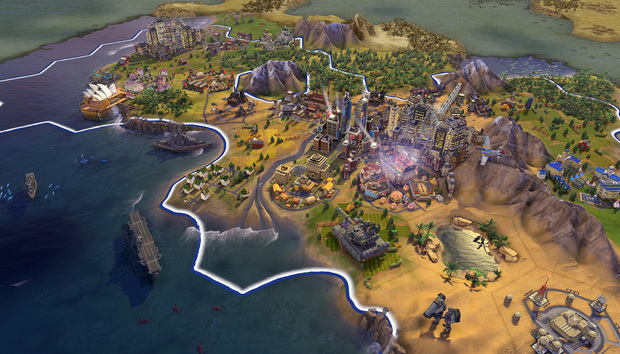 All that paired with AMD’s direct involvement suggests Civ VI should see a big boost in frame rate on Radeon cards, though we haven’t had a chance to test the game’s DX12 chops yet. The asynchronous compute improvements built into Nvidia's “Pascal” GPUs should help GeForce GTX 10-series graphics cards see the biggest boost for Team Green. The impact on you at home: Firaxis is also adding more multiplayer activities to make the already superb Civilization VI even better. You’ll find a new 50 turn multiplayer scenario dubbed “Cavalry and Cannonades” with reduced maintenance costs and no strategic resource requirement for units, as well as new “Four-Leaf Clover” and “Six-Armed Snowflake” multiplayer map types balanced for the called-out number of players. All the additions focus squarely on inciting combat and are available both online and offline.